He is bouncing in the back seat as we pull into a dirt driveway. The neighborhood is filled with ranch-style homes and there are horses in every field. He holds my hand tightly as we ring the doorbell, his sister on my hip. My 4-H leader from when I was a child greets us and hugs me to her. It has been over 20 years since we’ve seen each other and she marvels at how grown-up I am. I introduce her to my children. My boy is 4-years-old and is wearing his favorite long-sleeve t-shirt with a kitty and a heart on it. His sister is 2 and she won’t let me put her down. This woman I knew so well as a child feels like a stranger. She shows me pictures of her children and grandchildren. I only have vague memories of my time shared with this family and I feel suddenly old and slightly nostalgic. We follow her through the kitchen and down three stairs to a dimly lit room. All along the back wall are cages, stacked five high, filled with guinea pigs. We can hear some moving around and several wheek a greeting to us. My boy is wide-eyed and bouncing again. She tells us one of her guinea pigs was flown to Los Angeles to be used by the animators who made “G-Force.” This was the first movie my son saw on the big screen and he looks at me almost in tears from excitement. She takes out two little guinea pigs for him to choose from. He only takes a moment. He points at the smallest one. She is the Teddy variety, a wiry haired breed known for resembling the stuffed animal they are named after. She is black, white and brown. 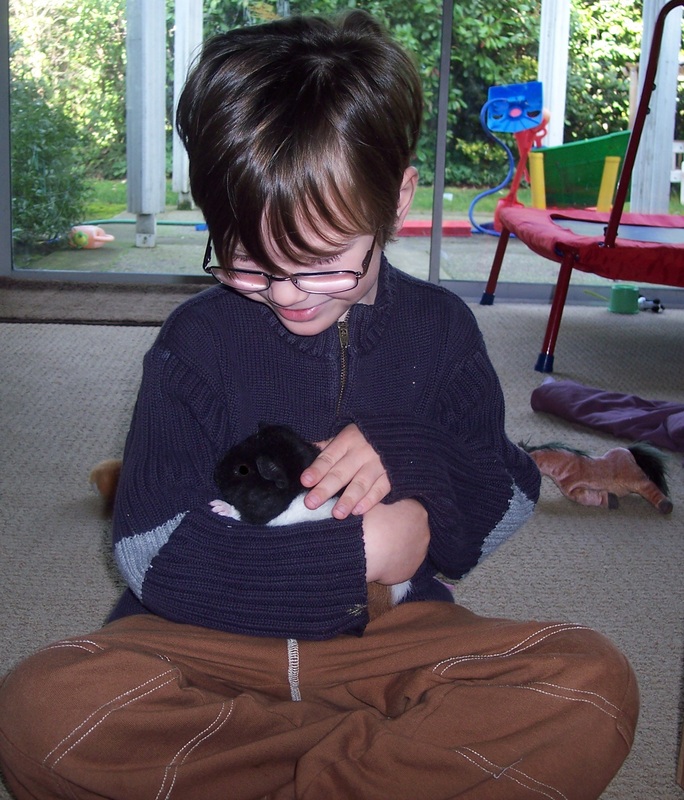 He names her Guinea The Pig. This was seven years ago and she was my Valentine’s Day gift to him. Since then, she has been featured in hundreds of his drawings, clay figures, short stories and even a few comic strip panels. He has created costumes for her, she has a stocking at Christmas and there isn’t a day he doesn’t pet her or watch her eat. When I walk down the stairs every morning she greets me with her familiar wheeking sound, calling for veggies from the fridge and a little petting. Her sound is as familiar to me as the hum of the refrigerator and I didn’t notice its absence until I saw the look on my boy’s face. “Guinea is dead,” he says. As he says the words, the reality hits him and he begins to sob. We sit on the couch and his sister joins us and we all cry together for our sweet little piggy, our Super Guinea, our Steam Punk Unicorn Pig and my son’s favorite thing in the world. We drive sister to school, but I let him come back home with me. 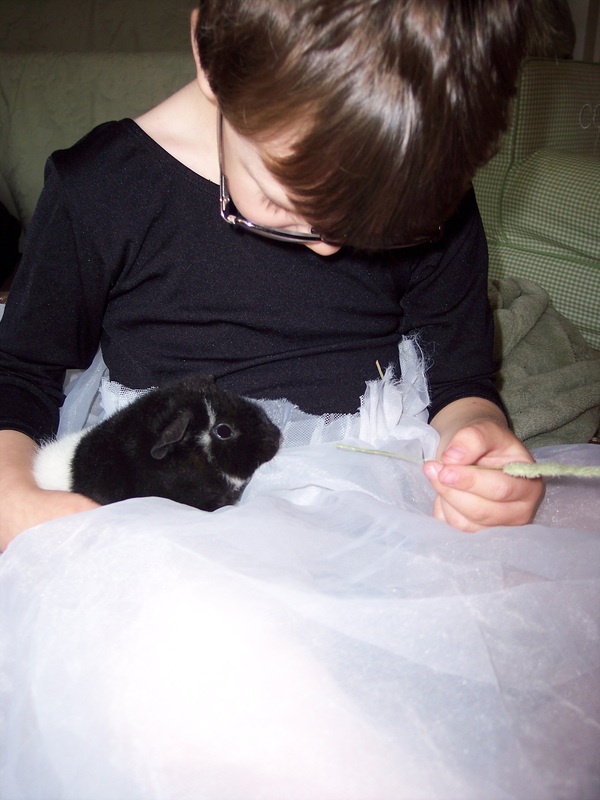 He sits down at the art table and begins drawing pictures and making pipe cleaner figures of his sweet Guinea. I can see tears come often, but he quickly brushes them away. I want to comfort him, but something stops me. When he was little, I’d cuddle him in my arms and kiss the tears off his cheeks. He would tell me things and I’d listen. He is 11 now and things are different. He listens to music with his door closed. He continuously turns the amp up while playing his guitar until I’m forced to tell him to turn it down. He reads books for an entire Sunday morning alone in his bed. I try and busy myself around the house, but keep finding him near me. I finally sit in my big comfy chair and he crawls in next to me. We sit in silence for a long time and I just feel the weight of him next to me. My boy, whose feet are bigger than mine and who wears deodorant now, feels the same in my arms as always. I rub his head and he purrs into me. I kiss his head and listen as he tells me how much he will miss her. We talk about other things too and the morning melts away in my chair. We eventually make our way to the computer to look at pictures and videos of Guinea. We laugh at the video of him at 4-years-old trying to walk her on a tiny leash in the yard. We marvel at how little she and he both were. Then he asks to see pictures of himself as a baby. We start with the painting of the nursery photos, and move through newborn hospital shots, pictures of him in my soft blue baby sling, propped up next to his baby cousin, sleeping on a blanket in front of the fireplace, starting to roll, crawling on all fours, videos of him laughing, food on his face, 1st birthday, playing in the backyard, dressing up, riding the tractor with grandma and on and on. After an hour of pictures, I tell my boy we’ve had enough and turn off the computer. We decide to get dressed and go eat lunch at the bookstore. On the way out the door, I point at the giant stack of books next to my chair. We end up buying magazines, because they aren’t books, and sandwiches. We find a cozy place on the patio to read, eat and drink tea. He points to a brown napkin stuck on a small rosebush. It is blowing slightly in the breeze. “You should pick it up and throw it in the garbage,” I say. “It is recyclable anyway,” he adds. He runs over and pulls the napkin loose from the rosebush. It flies through the parking lot and out of sight. He smiles and returns to his magazine.